In the middle of September ends the pre-order for the limited edition of Kanebo Milano Collection 2013 powder. 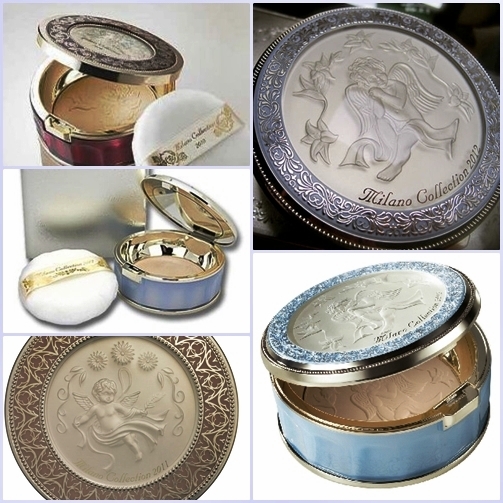 Kanebo always uses different motives for their Face-up powder usually they are images of flowers and angels. The collection is released every December since 1991, and it is always very successful. Last year Kanebo sold a record 580,000 pieces. The velvet powder is translucent and contains moisturizing ingredients. The formulation also includes UV block SPF14. Powder is only available through pre-order in the official Kanebo counters. The approximate price $160. Limited quantities are available. This entry was posted in News, Uncategorized and tagged Face-up Powder, Kanebo, Milano Collection by evaleonty. Bookmark the permalink.